When we are able to soothe ourselves -- to take a risk and continue painting anyway -- we can experience great relief from the confines of fear and perfectionism. In the first post in this series on self-compassion, we looked at how practicing self-compassion can help us expand our creative potential. There, I introduced the work of Dr. Kristin Neff, a respected self-compassion teacher and researcher. In this installment, I’d like to share more about the research findings of Dr. Neff and others -- and how we can use these findings to take our practice even deeper. Self-compassion is really no different than having compassion for others. It involves acting the same way towards yourself when you are having a difficult time, fail, or notice something you don’t like about yourself. Instead of just ignoring your pain with a “stiff upper lip” mentality, you stop to tell yourself “this is really difficult right now,” how can I comfort and care for myself in this moment? Instead of mercilessly judging and criticizing yourself for various inadequacies or shortcomings, self-compassion means you are kind and understanding when confronted with personal failings -- after all, who ever said you were supposed to be perfect? Since Dr. Neff’s early work, more than 100 journal articles have been published discussing self-compassion research studies. When we consider what the research says about self-compassionate people, we can extrapolate to a greater understanding of how self-compassion can benefit those of us yearning to express ourselves creatively. Increased emotional resilience. Self-compassionate people are less anxious, stressed and depressed. They feel less shame about their bodies. They are less perfectionistic, which can be an important trait for a painter focusing on process rather than product, perhaps for the first time. Willingness to take risks. Self-compassionate people are less afraid of failure. They feel emotionally safe even when things don’t work out, so it is easier to take risks. Those of us who paint for process can attest to those times when it feels incredibly risky to put something on the paper. Perhaps we even say to ourselves, “What if I wreck it?” as though a process painting could be ruined. 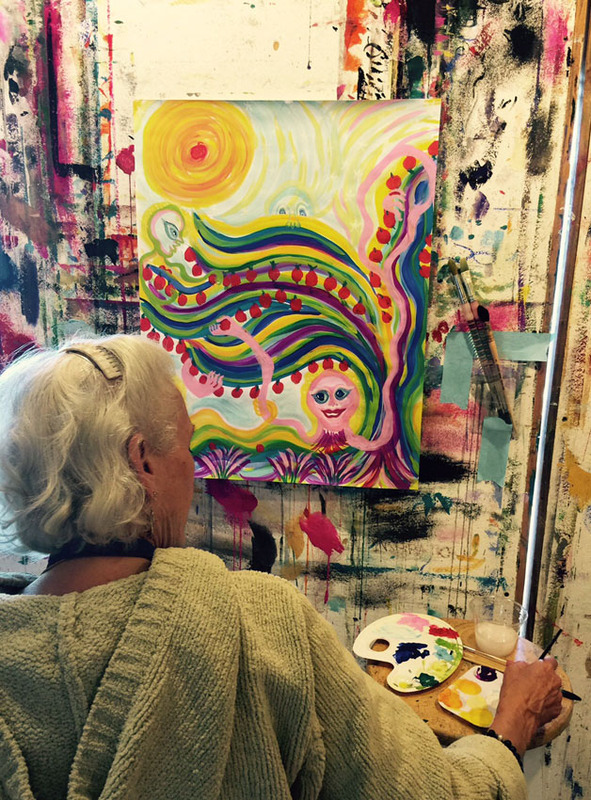 When we’re able to soothe ourselves -- to take a risk and continue painting anyway -- we can feel great relief from the confines of fear and perfectionism. Increased motivation. Self-compassionate people are more likely to try to learn and grow from mistakes. Although we say that there are no mistakes in process painting, surprises are common! Paintings often turn out differently than we expect. This may lead to disappointment or feeling like we’ve made a “mistake.” Self-compassionate people pick themselves up more quickly and continue on, rather than feeling paralyzed by discouragement or failure. Greater freedom from harsh judgment. Research shows that self-compassionate people are more likely to take responsibility for their mistakes. Again, there are no “mistakes” in process painting. Yet, in spite of this instruction, many of us experience our own harsh judgements saying, “I blew it.” If we know that our own harsh judgement is just around the corner, it is more difficult to “take responsibility” -- and by that I mean to accept that something we’ve painted didn’t turn out as we might have wished -- and to continue anyway. We commonly believe that we need harsh criticism to motivate ourselves. But self-compassion research says otherwise. Thus, when process painting, it can be useful to notice when the inner critic is becoming more harsh or loud in the mind. When we can meet those voices with self-compassion, they have less power to limit our creative expression. More happiness and better health. The research on self-compassion shows many benefits that relate to simply being human. As far as health is concerned, research shows that self-compassionate people are better able to exercise regularly, quit smoking, and go to the doctor when needed. They are also better able to cope with chronic pain by addressing it, and they suffer less from the effects. Findings showed that self-compassion not only soothes and heals negative states of being, but that it also feels good to be cared for and connected to something larger than oneself. This leads to joy and happiness, not just less negativity. 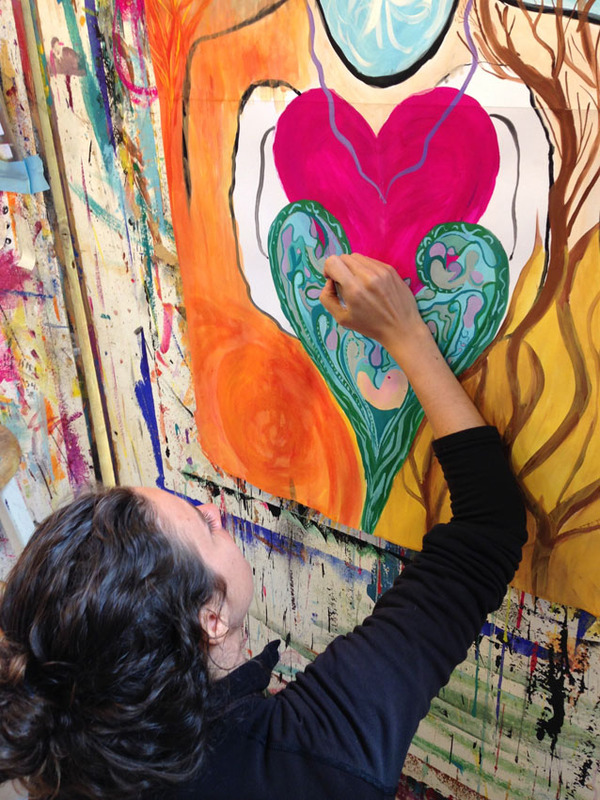 All of these qualities related to greater self-compassion -- including curiosity, risk-taking, emotional resilience, self-confidence and increased motivation -- can help us explore the rich experience of process painting. On a final note, it has been said that the research on self-compassion is boring -- because it is so predictably positive of psychological and physical well-being. I personally like that kind of “boring.” Perhaps next time you are feeling blocked in the creative expression of yourself, you might revisit some of these research findings. In the next self-compassion blog post, we’ll talk about various ways to practice and learn more about self-compassion as well as explore other authors and researchers who are champions in this general arena. This article presents a general overview of self-compassion research findings. For more detailed descriptions and source material, please visit Kristin Neff’s website at www.selfcompassion.org. 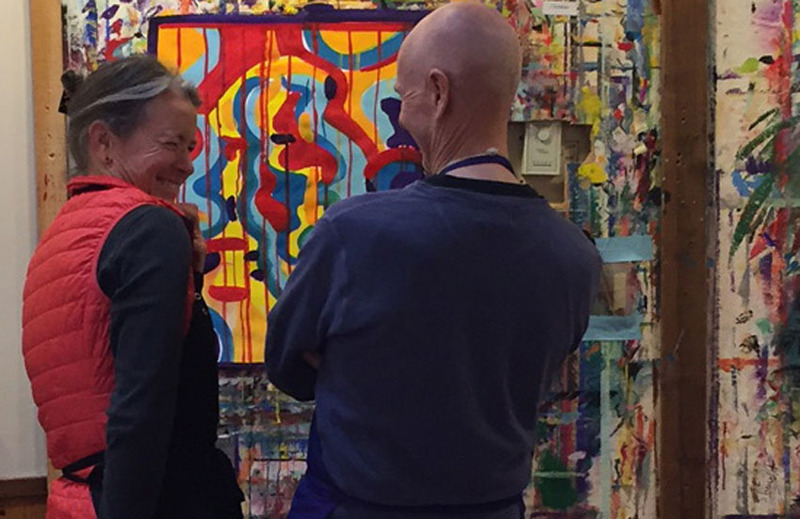 For more information about upcoming workshops and retreats with The Painting Experience, see our Programs page. Molly Siddoway King is an affiliate with The Painting Experience. She’s a retired psychotherapist, teacher, Outward Bound instructor and general personal growth junkie.